The voice of today's customer continues to grow louder, with more customers sharing thoughts, feelings, opinions, and recommendations in real-time across a vast social network. As a result, retailers need to keep their eyes and ears open, and embrace social media as part of their omni-channel strategy. 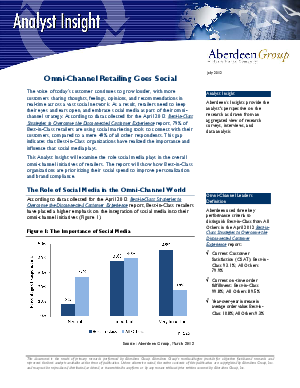 This Analyst Insight will examine the role social media plays in the overall omni-channel initiatives of retailers. The report will show how Best-in-Class organizations are prioritizing their social spend to improve personalization and brand compliance.